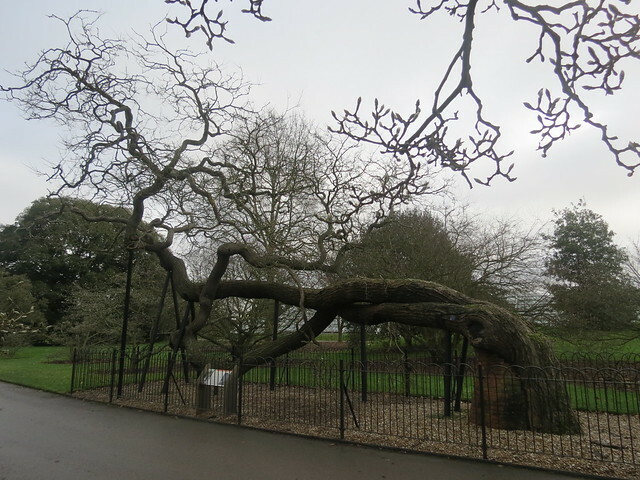 I had a great day out on Thursday at Kew Gardens in south-west London. There was a special offer to get free tickets between 22nd December and 4th January, so I decided to take advantage of the offer and take myself out on a little day trip. I’ve fancied going to Kew for a while because I heard they had a Japanese garden there, but at £16 a ticket I thought it was a bit steep. I haven’t really been on an adventure like that for a long time, but it reminded me when I used to take day trips while living in Japan (except it was much easier to find my way because I could read all the signs!). 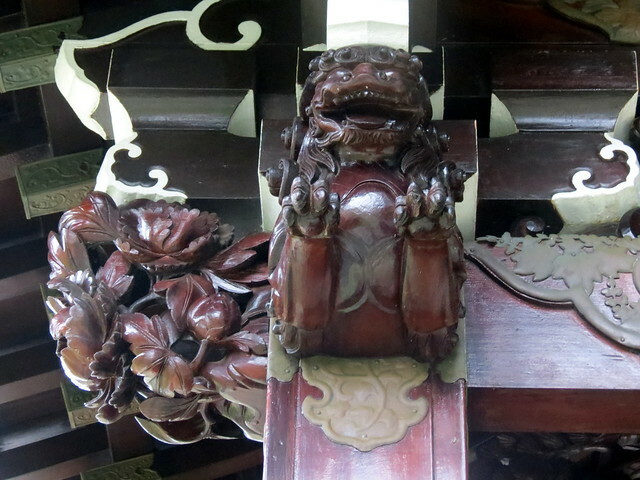 Shisa are common statues in Okinawa, and can also be found at temples and shrines all around Japan. 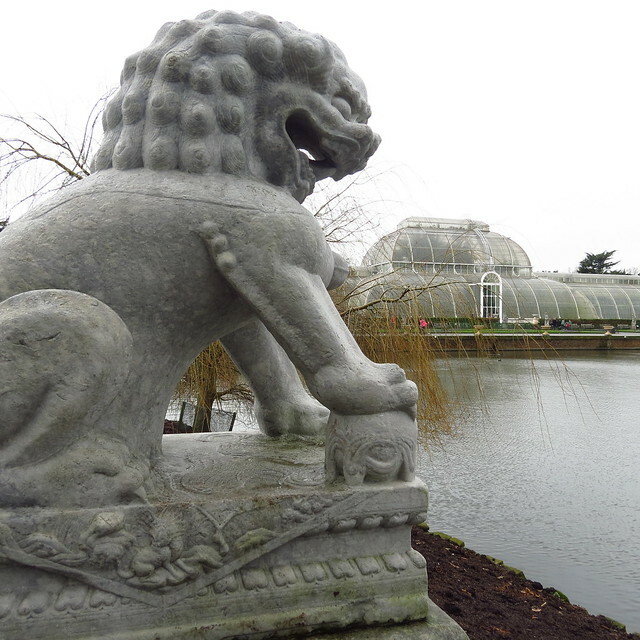 I couldn’t find anything in the guidebook about these shisa at Kew, but when I Googled I found this page which refers to them as Chinese lion-dogs, or ‘kylin’. 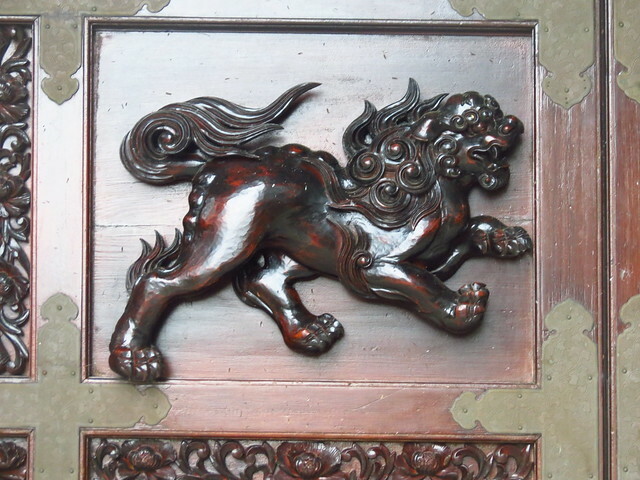 Shisa are a variation of Chinese lion-dogs, so whether these are Chinese or Japanese, they still started my day off on the right foot. The main Japanese area is called the ‘Japanese Gateway and Landscape’. As you enter, it’s a bit like stepping into Japan. I was really lucky that it was so quiet at Kew yesterday, because I practically had the area to myself, and I found it very calming. 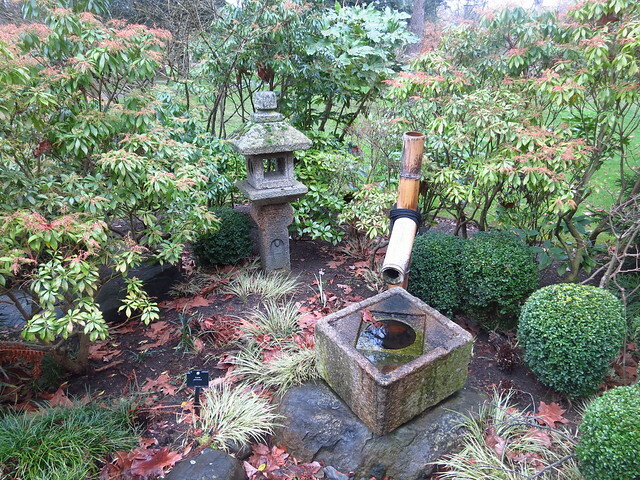 Walking into the Japanese garden, I passed this small water fountain, which reminded me of the kind of thing you might wash your hands at when approaching a small rural shrine. The main attraction of the Japanese garden is Chukushi-Mon (The Gateway of the Imperial Messenger), which is a four-fifths size replica of the Karamon of Nishi Hongan-ji, a temple in Kyoto. 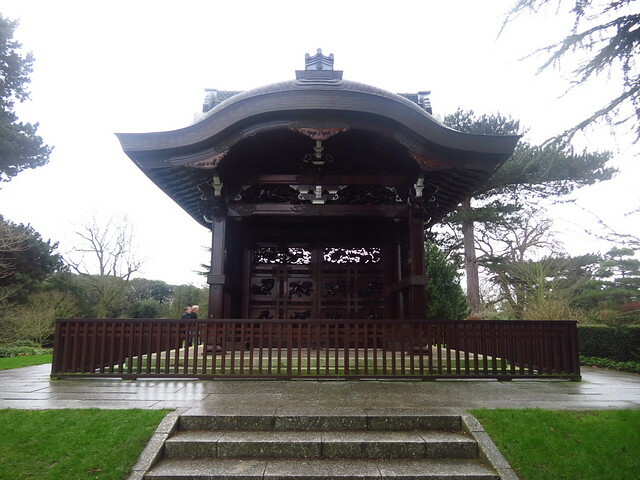 It was built for the Japan-British Exhibition in London in 1910, in the architectural style of the Momoyama period in the late 16th century. The replica is not nearly as beautiful as the original, but it was still very cool to see something so Japanese here in England. 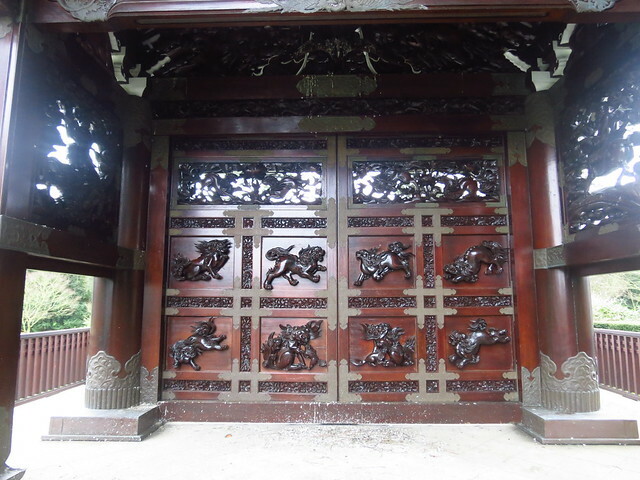 There are carvings on the gate, depicting flowers and animals, and portraying a Chinese legend about a wise master and his devoted pupil (according to the Kew guidebook). The main entrance leads into a ‘Garden of Peace’, calming and tranquil, with stone baths and a gently dripping water basin. The slope to the south is a ‘Garden of Activity’, symbolising the natural grandeur of waterfalls, hills and the sea. The third area, the ‘Garden of Harmony, links the other two and represents the mountainous regions of Japan, using stones and rocky outgrops interplanted with a wide variety of Japanese plants. I don’t know much about Japanese plants, but I was surprised to see some cherry blossom while I was there. 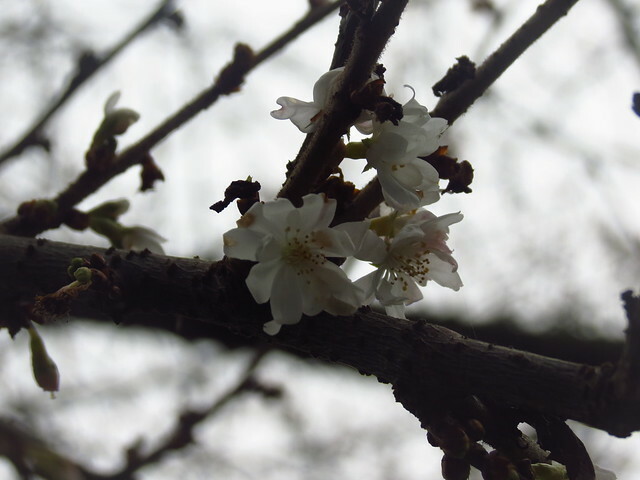 Looking at the label on the tree, it said it was a ‘Winter Cherry’ tree, so I guess they must blossom in the winter. It would be interesting to visit again in spring or autumn and see the different colours. 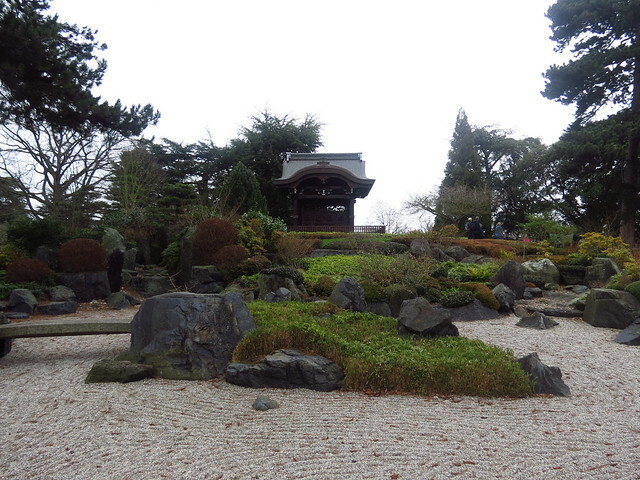 There were two areas which were like Zen gardens, with signs asking people not to tread on the stones. It was a shame to see that the stones were covered in leaves, but I guess it would be hard work to keep them tidy in the winter. 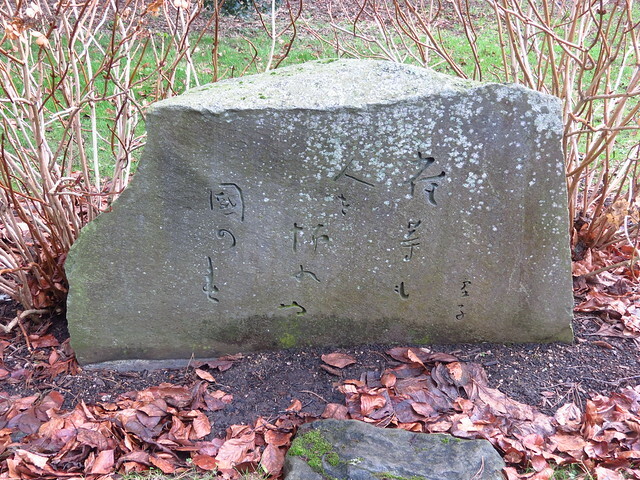 The haiku is by Kyoshi Takahama (高浜 虚子), and was composed at Kew in 1936. Kyoshi Takahama (1874 – 1959) was a Japanese poet during the Showa period. He was born in Matsuyama, lived in Tokyo during his adult life, and later moved to Kamakura. 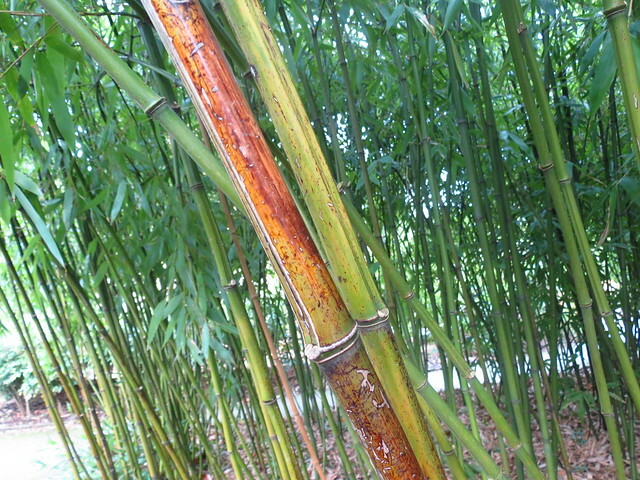 Another Japanese attraction at Kew is the Bamboo Garden. It wasn’t quite Arashiyama, but it was still nice to hear the wind rustling through the bamboo. 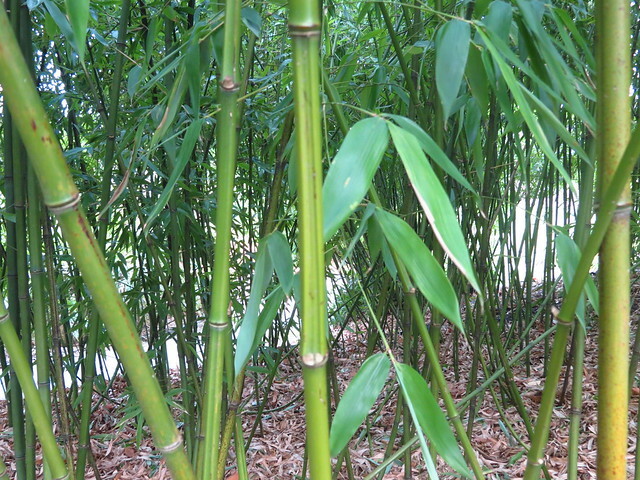 Inside the Bamboo Garden is the Japanese Minka. The Minka was originally a farmhouse, built around 1900 in a suburb of Okazaki City. The house was donated to Kew as part of the Japan 2001 Festival. Ever since I read this I’ve been wondering how on earth one would go about transporting an entire house all the way from Japan to England?! 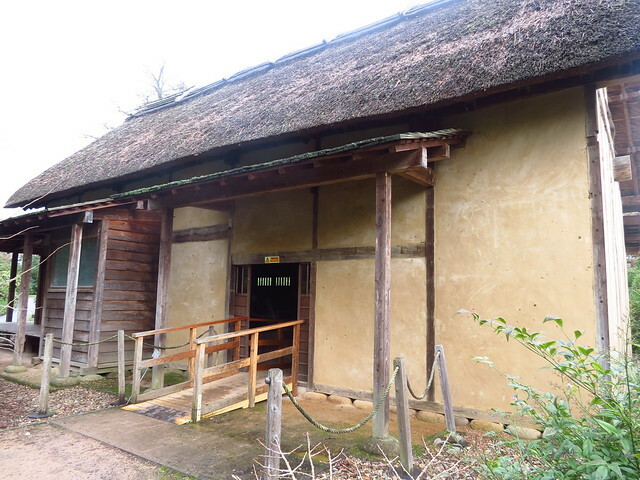 According to the Kew website, the dismantled framework was shipped to England, then a team of Japanese carpenters reinstated the joints on the Minka House, which are constructed without nails, and a team of British builders who worked on the Globe Theatre in London built the mud wall panels. 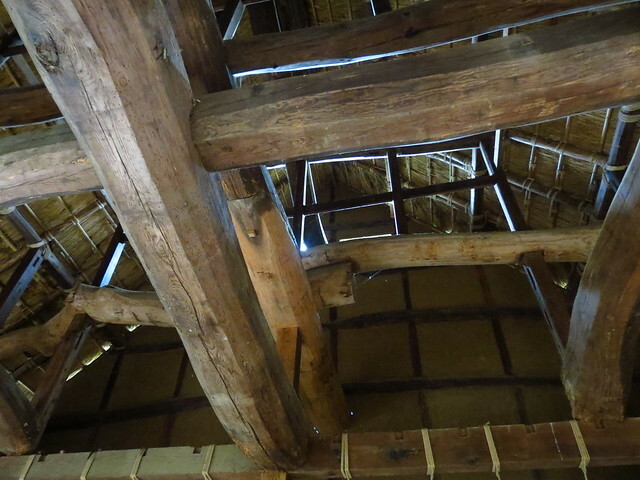 The roof was thatched with Norfolk reeds and wheat straw. 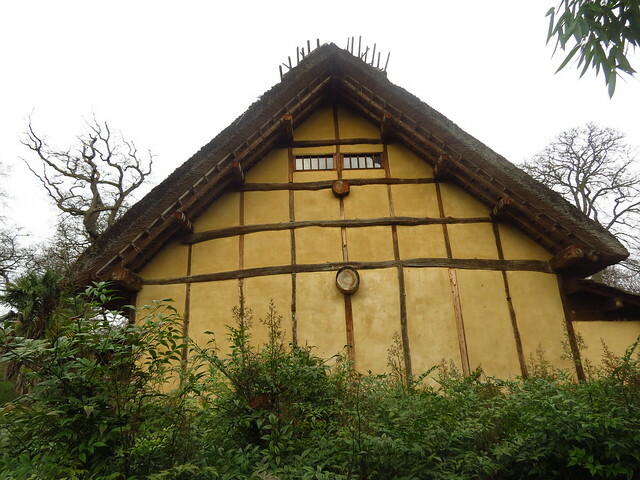 The house has a frame of pine logs tied together with rope, wattle and daub walls, and a lime-washed exterior. It stands on a base of large stones, and would not have been cemented down in Japan, to allow it to move during earthquakes. 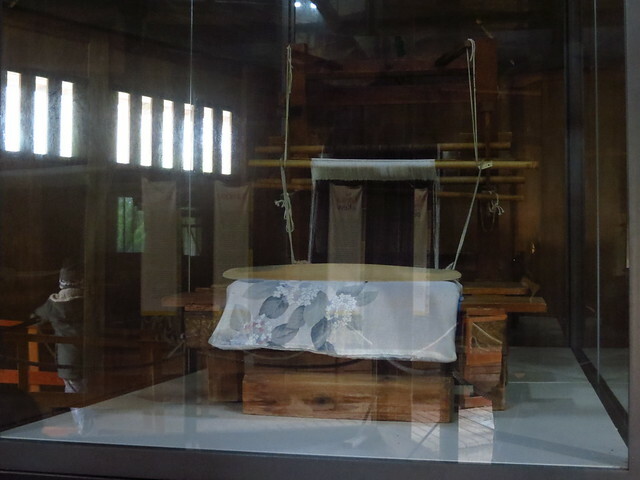 Until the middle of the 20th century, many Japanese country people lived in wooden houses called minka. They had sturdy wooden earthquake-resistant frames, mud-plastered walls and thatched roofs. They are uniquely ‘green’ buildings as everything used in their construction comes from plants or directly from Nature. 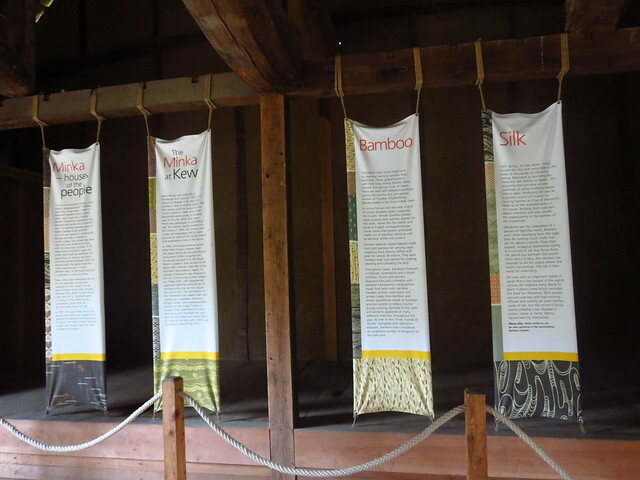 Inside the building was some information about Minka houses, bamboo and silk. 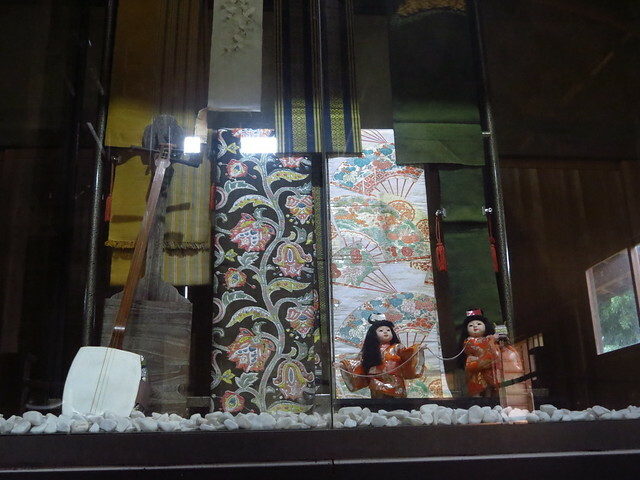 Also on inside the house was a display cabinet containing some silk kimono fabric, Japanese dolls wearing silk, and a shamisen. 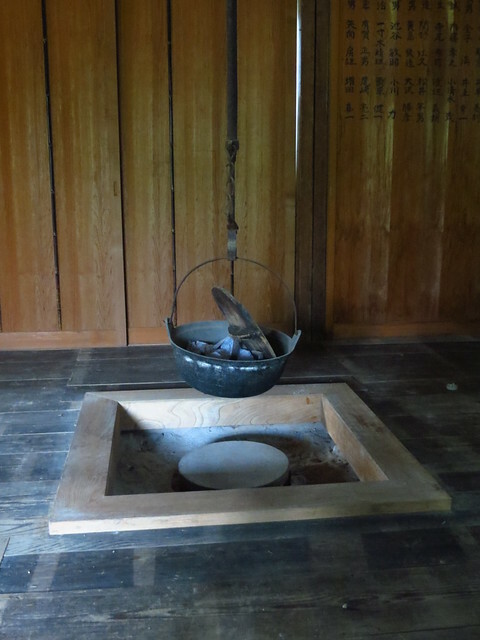 I didn’t see a sign explaining why the shamisen was there, but I suppose it was just a symbol of the way of life led by the people in the Minka houses. You can just imagine gathering around this space to eat and be warm, can’t you? 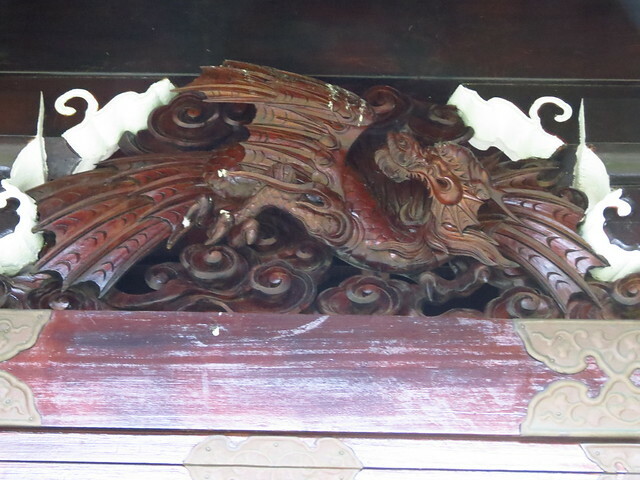 The tree is actually originally from China, but was introduced to the UK via Japan, where it was commonly planted in the grounds of Buddhist temples. 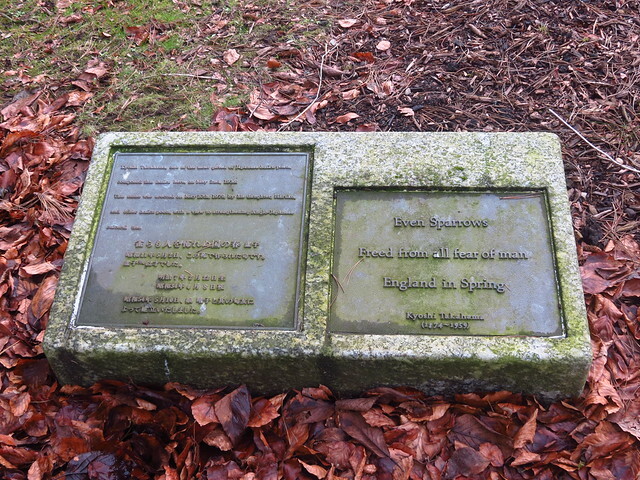 The species (Styphnolobium japonicum) was introduced to the UK in 1753, and this particular tree was planted around 1760, making it over 250 years old! My day out at Kew Gardens was even better than I expected, and there was a lot of interesting stuff there, as well as all of the Japanese things I’ve mentioned above. If you’re interested, you can see my whole collection of photos on Flickr. Look out for the peacocks – utterly beautiful! (Incidentally, I just learnt that ‘peacock’ in Japanese is くじゃく (kujyaku), which sounds much cuter than ‘peacock’, and makes me think of the boy’s name ‘Jack’. Anyway, if you like the look of Kew and fancy going there yourself, it’s easily accessed from the Kew Gardens stop on the District Line (London Underground). For more information, please visit: www.kew.org. Kyoshi Takahama was an interesting haiku poet but took Shiki’s ideas of shasei too far, and did untold harm to both the developing Japanese haiku genre, and Western styles of writing haiku. 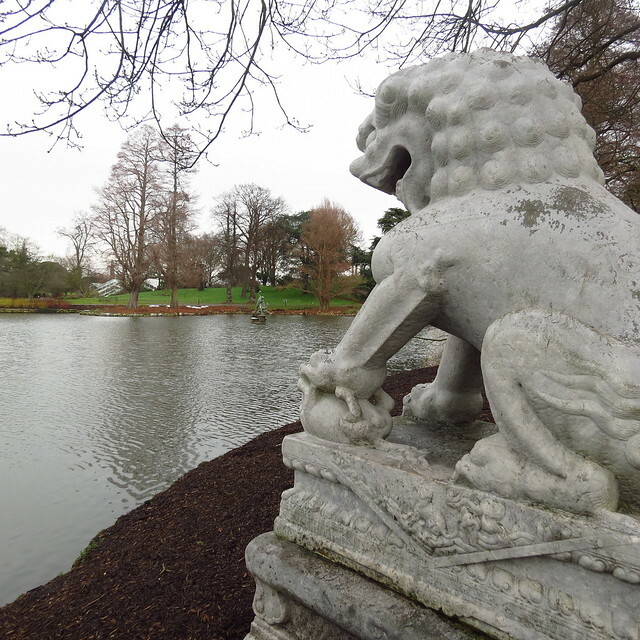 I loved your walk around Kew Gardens, many thanks. Thanks for stopping by, Alan, and for your thoughts on Takahama. I’d be interested to know more about the ‘harm’ he did to haiku, but unfortunately I won’t be able to join your workshop. He did rescind about making it a strict objective realism approach which isn’t very Japanese, but very Western. I’ll be releasing articles throughout 2013-2014 about this and other aspects out of the course I’m running. If you check Area 17, you’ll see I’ve had a book on gendai haiku released which has been received favourably. If you go to the Amazon page and use Look Inside you’ll find I play with form although haiku is more genre and not form. I also write 5-7-5 English-language haiku and won awards for them. Even Basho and other classic haikai verse writers broke the 575 on a number of occasions. Japan’s greatest living haiku poet, and a global philosopher-poet through his gendai haiku regularly breaks the 5-on / 7-on / 5-on shape, alongside writing both kigo and non-kigo haiku. I tend to try to write closer to what Japanese haiku is, rather than Western ideas. 🙂 Maybe we are! Thanks for the haiku! Thank you for the post. Absolute delight is the only way to describe it. 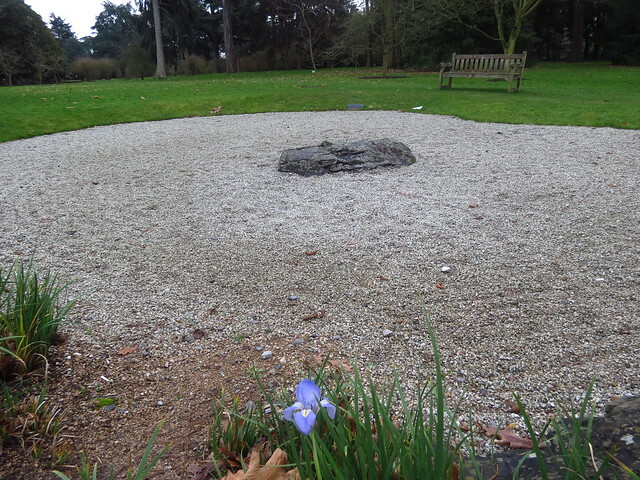 I always wanted to go to Kew Gardens and I didn’t know about this Japanese Garden there. One more great reason to go! 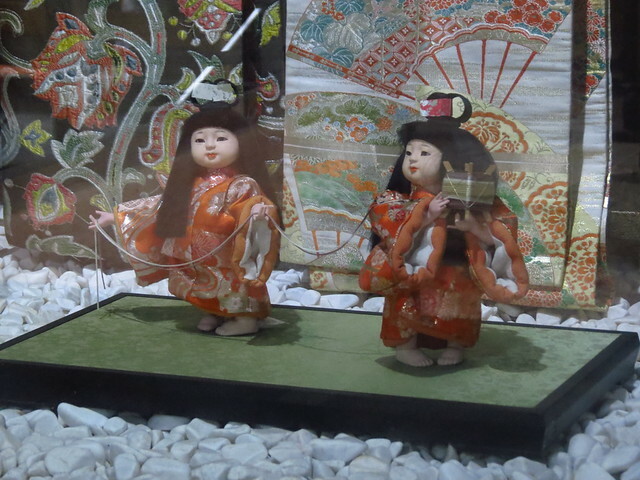 In Sao Paulo, we have a Japanese Pavilion that was a present from Japan to celebrate the 400th anniversary of the city. I’ve been there 2 times and it is really nice. There is a pond full of carps! The Japanese Pavilion in Sao Paulo looks really nice – I’d love to visit there one day! I went to Kew yesterday. Ships that pass yet again! 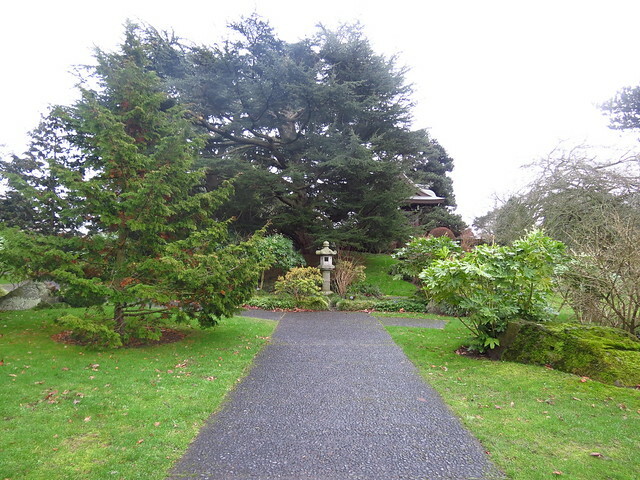 I really enjoyed my visit to Kew Gardens, especially the little extras like the Minka house and the bonsai greenhouse. 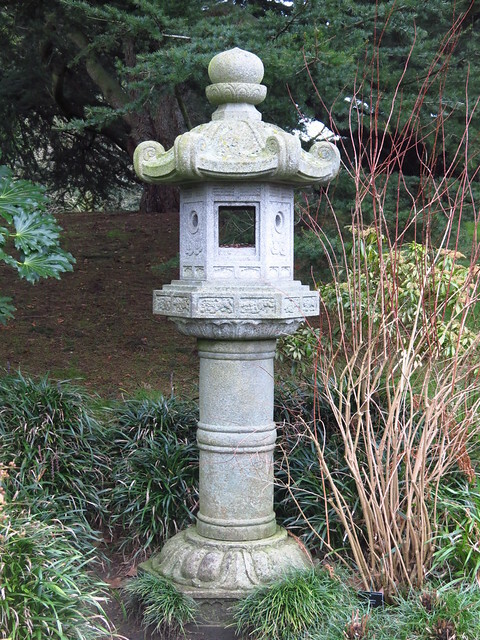 Have you been to Holland Park’s Japanese Garden? It’s free and quite nicely laid out. My favourite Japanese garden though is the one in San Francisco – I could quite happily live there forever, surviving on green tea, mochi and taiyaki from the cafe. Le sigh. I’ve not been to Holland Park yet, but it’s on my list! 🙂 The garden in San Francisco sounds really lovely! I visited Kew Gardens today and followed pretty much the same Japanese path you describe here. I was looking for information to write a post about it, but I might as well just link yours, it’s perfect!